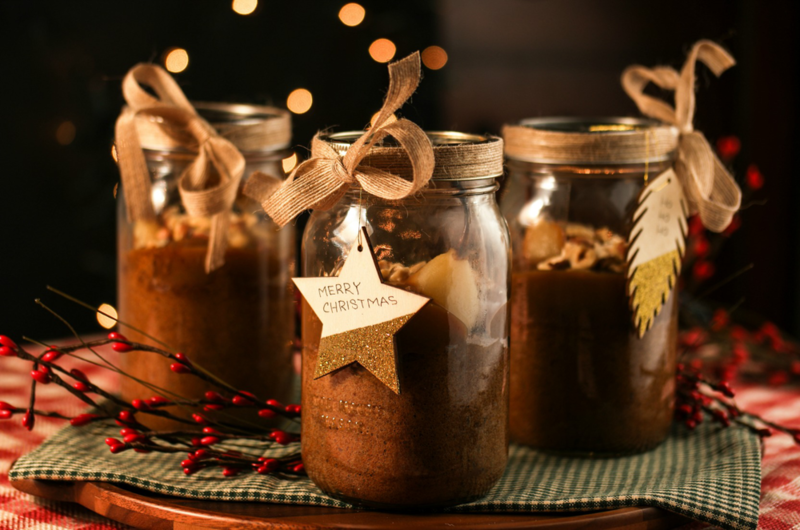 A whole poached pear baked into the center of this low-fat gingerbread cake makes a very festive presentation in a mason jar, and is a ready to eat treat. In a large sauce pan combine the wine, sugar, water and spices and bring to simmer. Carefully place the peeled pears into the simmering liquid, cover and cook for 30-40 minutes, or until a knife inserts into the pears easily. Rotate the pears in the liquid a few times during cooking to be sure they cook evenly. When the pears are tender, remove from the liquid and set aside to cool slightly. Preheat oven to 350 degrees, Fahrenheit. Place 4 clean 4-quart mason jars on a cookie sheet and set aside. In a medium bowl, add the flour, baking powder, baking soda, salt, cinnamon, ginger and cloves, mix to combine. Set aside. In a medium bowl whisk together the eggs, apple sauce, maple syrup, molasses and vanilla until well combined. Pour the wet ingredients over the dry ingredients and mix until just incorporated, taking care not to over mix. Spoon the cake batter evenly between the 4 mason jars, trying your best not to let the batter touch the side so you don’t end up with a baked on mess at the end (it take a little more time but it’s worth it!). The batter should fill 1/4 – 1/3 of the jar. Next, carefully place a pear into the jar and press it into the middle of the batter until it feels firmly in place, taking care not to break the stem. Repeat with remaining pears. Bake either on a cookie sheet or directly on the rack for 25-30 minutes or until a knife inserted into the cake comes out with moist crumbs. Remove carefully from the oven, one by one as they can slide around on a baking sheet, and let cool completely. To finish, pour a layer of caramel sauce on top of the cooled cake, sprinkle with hazelnuts if desired. Screw the lid on the jars and give to someone you love! The cakes should be enjoyed within three days.